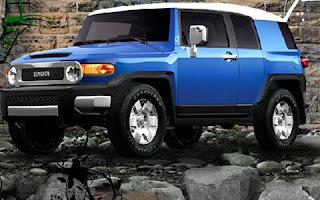 The New FJ Cruiser from Toyota looks smart and cool, I find it pretty good as a havy duity car specially for the Chalet and long distance way. the thing that this car does not come with GPS system, or bluetooth functionality, the price is reasonable It costs only 10000 KD. I called Al-sayer today and ask them if it is possible to add some optional features like navigation device and they told me it is not possible for now! but maybe later they can as they stop any preorder of FJ cars for an uncertain time.